A sort of mini-project, sort of titled in my usual way after a song (Andy Warhol’s Dead by Transvision Vamp this time) – 32 tins of tomato soup to the same approximate dimensions of Warhol’s Campbell’s soup cans. Appropriation of an idea, twisting it to my own chosen media, and my own preferred soup flavour. Photography of a “readymade”? Does this fit in any way with my supposed “grand narrative”? Well, I suppose it’s similar to the objects in A Forest, although that’s where I think the connections start and end. Does this matter in the great scheme of things? Am I what Lisa Barnard expects me to be/interprets me as wanting to be? Am I too superficial in my making? In my ideas? I think I’m getting closer to the realisation that if I work one theme, a grand narrative, I will soon tire and give up. This random approach may well dilute my work, confuse my oeuvre and ultimately deny me any sort of recognition within the outside world (and possibly even an MA), but it is more in keeping with my own psyche, my own way of doing things and my own raison d’être. Should I strive to produce the work that others expect of me, or what interests me? Even if that interest is only in transitory. Firstly, just a note to say I've contacted Todd Stewart (one of the Oklahoma University faculty) by e-mail to request permission to use some of his Ruscha images as reference, and also to ask if he can help me in tracking down Bob's Service in LA. If they visited them all, hopefully he will. A bit of a diversion, something I had been considering as a possible project but I decided there wasn’t enough in it to be the final project. Appropriation of another idea, this time it’s Andy Warhol’s Campbell’s soup tins. I had wanted to do the full 32 tins of Campbell’s soup, but there’s only half a dozen or so that are available in the UK so I moved over to something a bit more personal; tomato soup is the flavour I eat 99% of the time, to it seemed completely appropriate. 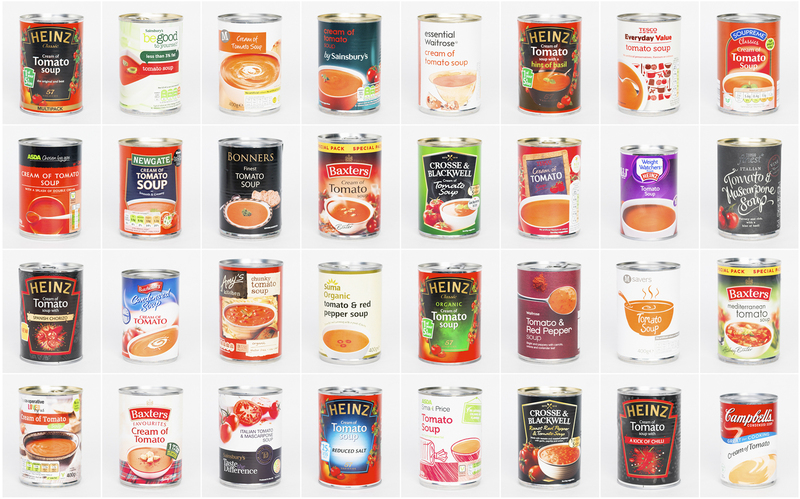 A typology of tomato soup tins so tying into my interest in that mode of working, and it’s nodding towards the work of Warhol and my chosen essay subject of appropriation in photography. T4 : A little "bonus"
Whilst I've been going around searching for petrol stations, it's been increasingly obvious where the old petrol stations have been. It's the style of the buildings, the concrete plinths on the "forecourt" and such. I'm not going to be looking at these, I could be looking for these things for far longer than I have to spend on the exploratory project. However, I found out about this one in Whitechapel near Longridge so thought I'd go that way when rephotographing those I'd seen the week before. A bonus, but not one of the ones that will form part of the 52 that I will hopefully reach before too long. Last weekend was a disappointment. The camera I had wanted to use wasn't really suitable, and I couldn't find a couple of the stations that I thought I should be able to. Further research has been done and it's another disappointment. There are currently only eleven petrol filling stations located within the Ribble Valley, and one of those I have a little niggle about - I don't recall ever seeing it, although granted it's not on a road I go down often. 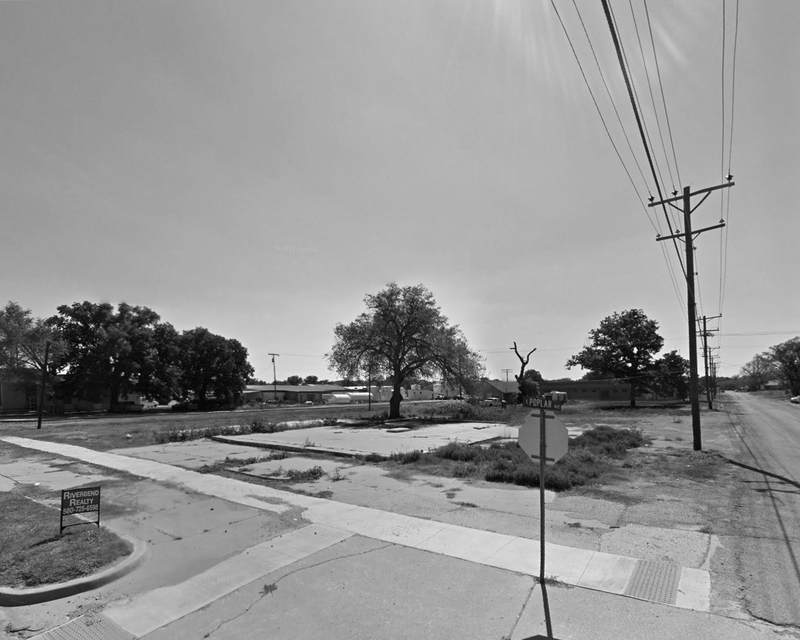 There was another that I've located on Google Street View, but can confirm that it's now been flattened and being replaced by housing. Whether it be ten or eleven though, it doesn't really matter as it's not quite up to the magic number of 26. I'll have to open up my area of exploration, and to be fair it shouldn't have to be by much to start getting some additional ones in the net. I'll just keep pushing the boundaries until I reach my total. I've visited all of these over the last two weekends, except the one in Langho. I'll hit that one tomorrow and also go to some of those I visited with the MF camera. After that... it's back to pushing the boundaries. This is what I have so far with the Canon DSLR though. So, a first disappointment, not an auspicious start. I had thought that was an old fashioned style pump too (so probably not in service). Maybe it was somewhere else I passed whilst do another project in the area? I'll keep an eye out for it. I headed off to Longridge and soon found a second problem. I'd planned to shoot the project using medium format cameras; I have two of these and started off with the Pentax - a bit friendlier to use and a pile more pixels to play with. The lens is 55mm, which will equate to probably about 42mm on a 35mm camera and this is wider than the Hasselblad with it's 60mm lens and crop factor from the old digital back. However, the lens is still too long for what I want. You see, in America, there's lots of wide open spaces, and even when the spaces aren't wide and open, the roads are still wider than the little roads we find in our rural towns and villages. Using the Pentax, the Texaco petrol station in Longridge pretty much filled the frame. I prefer a wider lens, and a level of distance between the subject and the viewer. So, a wider lens needed and therein lies the third disappointment. £1700! I'll have to resort to eBay and hope something turns up. Having said that, I can always use my Canon - nothing wrong with it at all, but just not what I had intended. Not quite back to the drawing board, but an obstacle to overcome. The inspiration for Ruscha’s Standard painting is now a mechanic’s workshop. Is this now a house? The last one, demolished and replaced with a house. Not a lot remains of Flying A... although it has kept to its car related heritage. Rimmy Jim's Chevron burnt down back in the late 60s (see here), whether this has anything to do with the "Mother Road" being replaced I've no idea (my suspicious mind tends to think it might). It was't rebuilt though, what was the point? I think this will be the place. From petrol station to restaurant to empty. 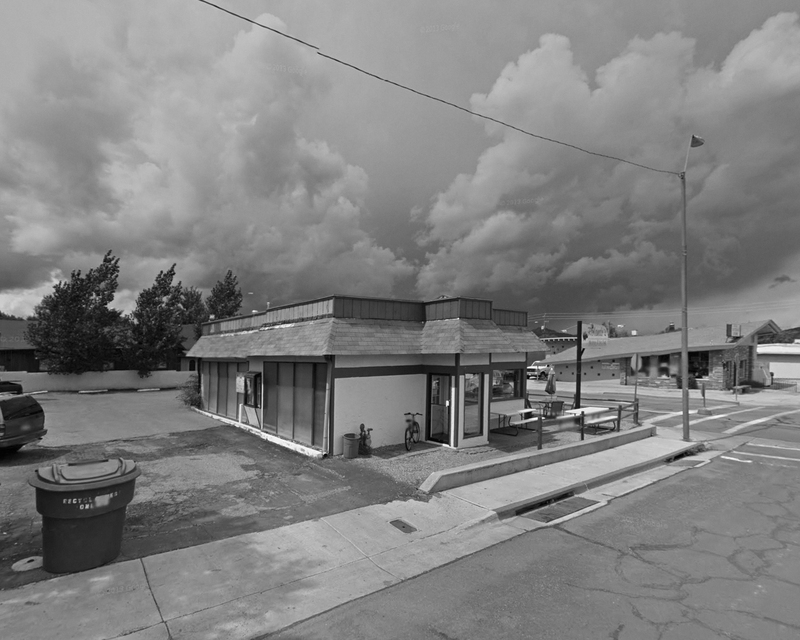 Möll has shown the location of the second of Williams’ gas stations as being a Mexican restaurant, the Road to Ruscha project the same (have they just used his research?) There are little niggles with this one for me, the buildings in the background have changed as well, although this can’t be seen in my view use to where I’ve selected. Having said that, if one building changes, then why shouldn’t the next? The “closure” of the 66 meant that Williams has changed it’s source of income form the road and the traffic that used to pass through (according to some random “fact” on the Internet, 1m trucks/year would pass though) to tourism, so more restaurants, gift shops and hotels are needed… It does look like another repurposed gas station in its place though. 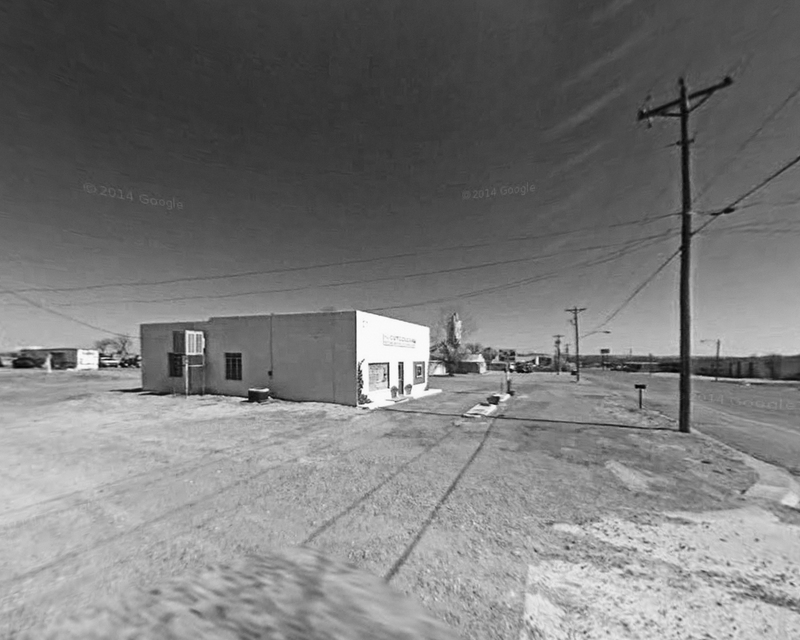 The Jackrabbit Trading Post is still there and still in use, however the GSV car has not passed by it from the old Route 66 road it’s tied on. 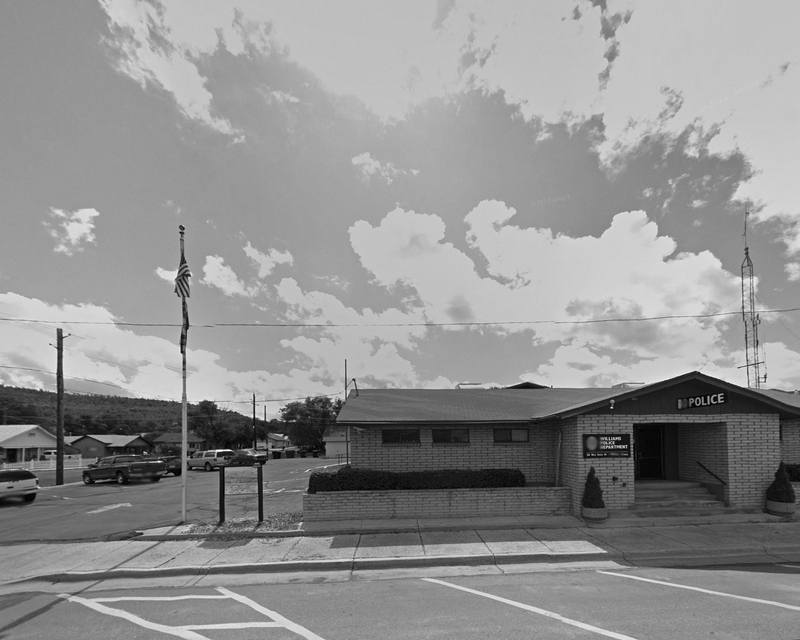 It’s only possible to view the back of the building form the I40 that passes behind it. It’s possible to see the old jackrabbit sign though, so it’s clearly the right place. It’s one of the drawbacks (together with the burnt out clouds, less than ideal contrast, compositions, etc.) of working with images being made available by someone else though (i.e. Google). Another one that has been taken down and built over, this time it was the building in the background that makes it clear it’s the right place – the satisfaction of seeing this is quite something, makes the forensic search through the street corners (in this instance) of a town quite rewarding. Things like this also mean I’m looking more closely at both the Ruscha image and the GSV, it puts me in mind of the analysis being made by Errol Morris in his Believing is Seeing book. 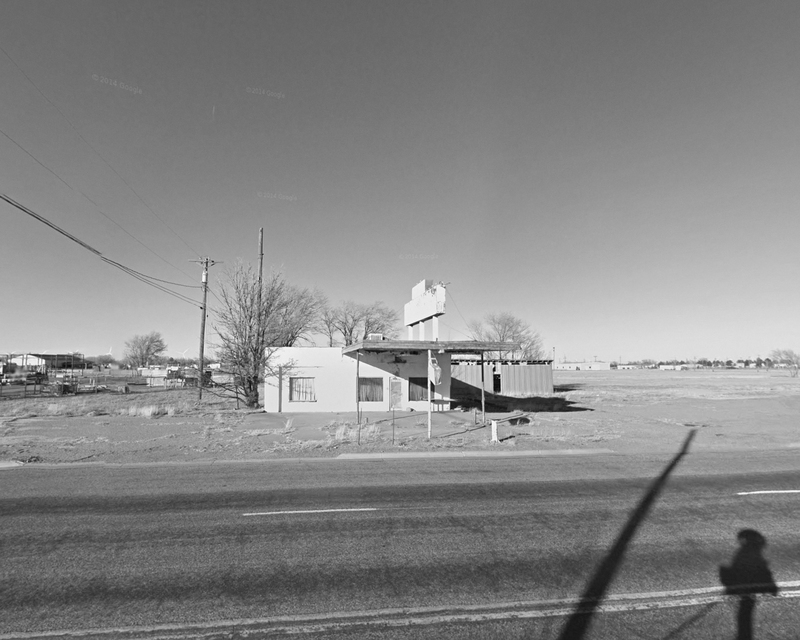 Another that I only located because of the work of the Road to Ruscha group who photographed some of the surroundings, referencing the Sandman Motel just over the road from here. 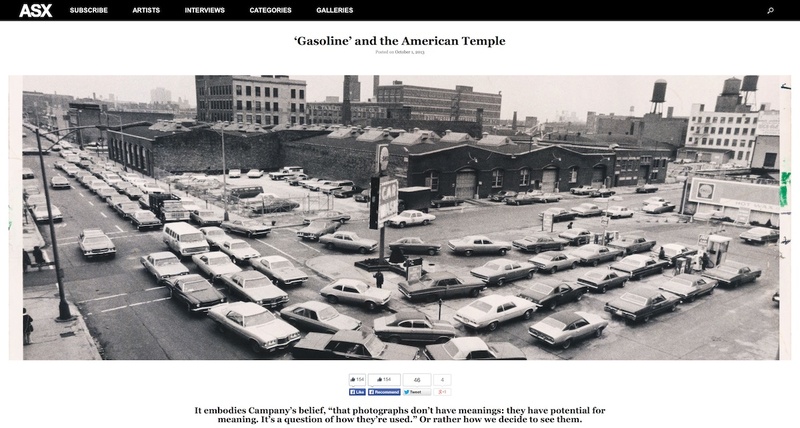 Di Bello, P, Wilson, C & Zamir, S (eds) (2012) The Photo Book: from Talbot to Ruscha and beyond. London. IB Tauris & Co Ltd.
Ed Ruscha decided to work his project whilst driving the thousands of miles from LA to Oklahoma to see his parents. He also liked the word "gasoline" and the "specific quality of 'twenty-six'" (Richards, p31). The 26 photographs document further iterations of that journey through the gasoline (or Petrol for those of us this side of the Atlantic) stations that were peppered along the route, in some instances in areas devoid of much else. 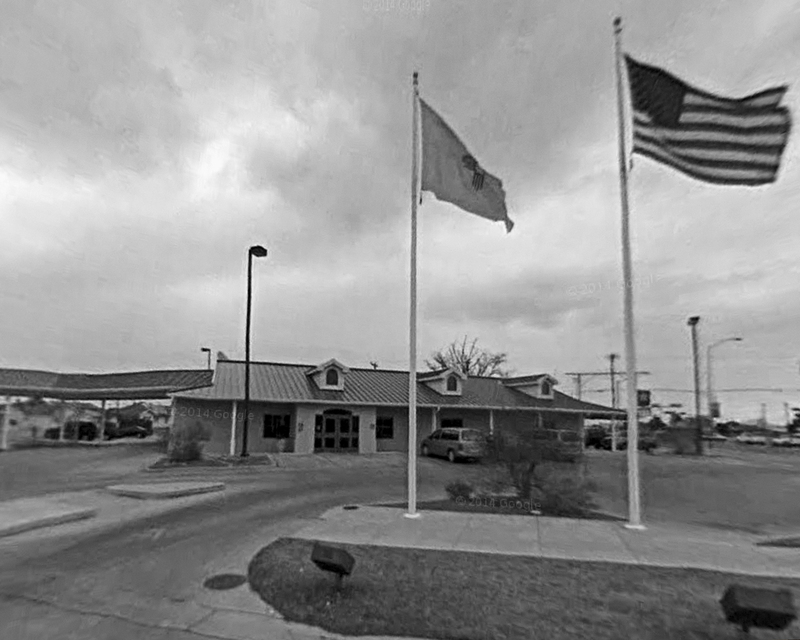 The presence of these stations tell us of the size of America, the fascination with the great American road trip, Route 66 and the culture of the time. Was this the intention with the project though? It certainly confused at the time, and book sellers didn't know how to classify the book. Rust hasn't been the only one to photograph petrol stations, but that can be subject of another posting. What I was meaning to do here is provide the 25 stations I have found during the last couple of weeks of fevered searching. This is the one that I've not tracked down yet. Los Angeles is a pretty big place and there aren't many clues in the photograph. Certainly "Bob's Service" doesn't come up with anything, other than links to Ruscha's photograph or things that seem unrelated. The only thing I can assume is that it's somewhere between the Santa Monica seafront and the Texaco on Sunset Strip. However, this isn't an absolute given as some are known to be "out of order", going from LA to Oklahoma. 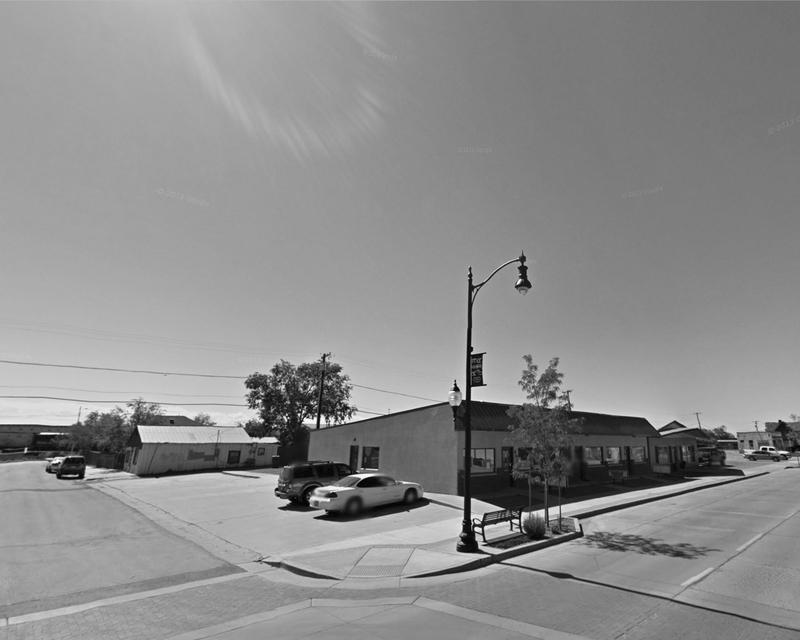 This Texaco has gone, although the location was found thanks to the presence of the Har-Omar restaurant behind it. Here, the composition is broadly similar to that used by Ruscha, albeit a touch wider. Still looking pretty much as it did, although a bit more "tired" perhaps. Just like the majority of those located, it's no longer a petrol station, the need having passed with the decommissioning of Route 66 as the major transport route - this one is in the shadow of the I-40 Needles Freeway which took the traffic over W. Broadway. This is one that I'm a little less confident about. There aren't many clues to be taken from the original photograph, and to be honest, the size of the cabin seems a little small although as can be seen in the others, a lot can happen in the intervening years. 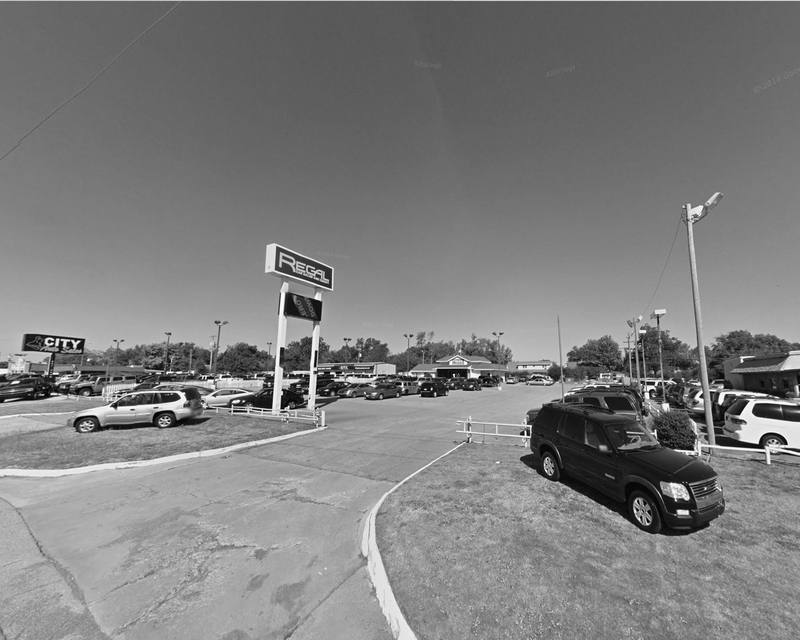 This is the site that Martin Möll uses in his Twenty-six Gasoline Stations Revisited though (I found this work through the images included in Todd Stewart's Context site that I've linked to in the titles here). This one was problematic. Ludlow has been pretty much levelled when you look at the Google satellite and Street View maps and nothing even comes close. However, this is near Ludlow not in Ludlow. 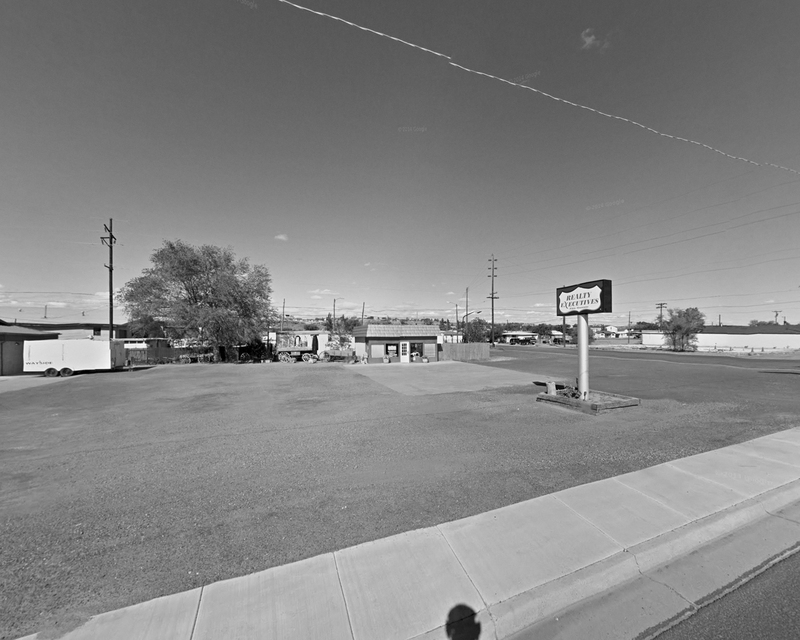 The Context site has an image of what it looked like in 2013, so using with the help of Flickr and Google, I've been able to find that station in Newberry Springs but my "problem" is that it's 29 miles from Ludlow. So, is it actually the right one? Evidence would say "yes", my inner voice says "no"; maybe my English idea of "near" is very different to an American idea of the concept. After the uncertainty of the last one, I thought I'd found Phillips 66 because of the distinctive shape, but on closer looks it's just not the same. The scaffold at the front of the roof is a different shape, but the much bigger problem is the shape of the hills behind. Instead, it would appear that the dart-shaped roof has been removed and we have a different building. This is as deduced by the Road to Ruscha and Martin Möll sites. The Route 66 section of my project is heavily research driven, a more forensic research than might normally be expected because I have to find his 26 gasoline stations locations based on a series of simple captions - Bob's Service, Los Angeles, CA or Texaco, Sunset Boulevard, Los Angeles, CA. The only other geographical clue is that they're all on Route 66, so that cuts it down somewhat, although "Los Angeles" is still a pretty major length of road to go checking all the buildings on... 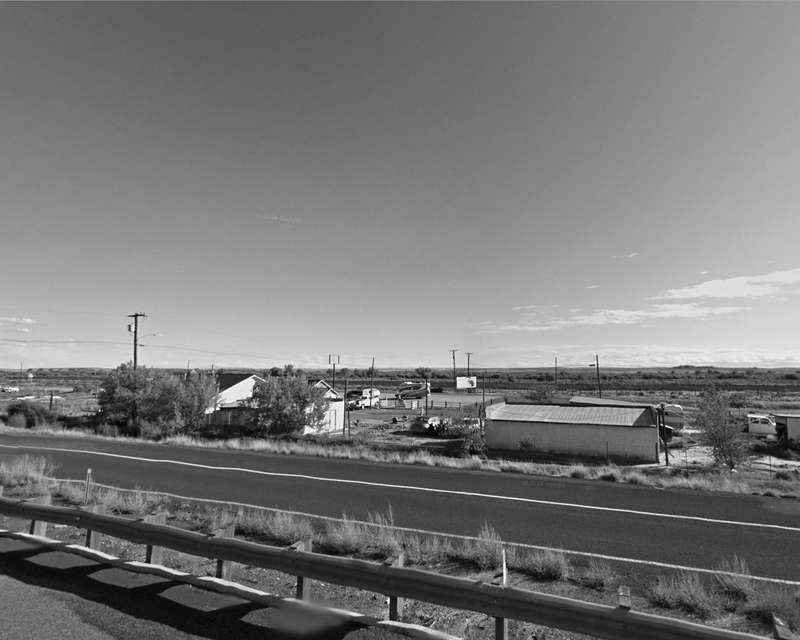 I have found a useful resource though, and that's the website of a research based art project called Road to Ruscha by the art, art history, architecture, and geography students and faculty of the University of Oklahoma, who covered the journey back in 2013 (the 50th anniversary of the book). There's also a few blogs around the subject too, such as this one by one of the faculty members. I got quite excited when I saw a map with all the photographs from the book pinned on it, I thought my research had been shortcut. But no, the map is wildly inaccurate and I can only assume that the locations were marked from a distance. 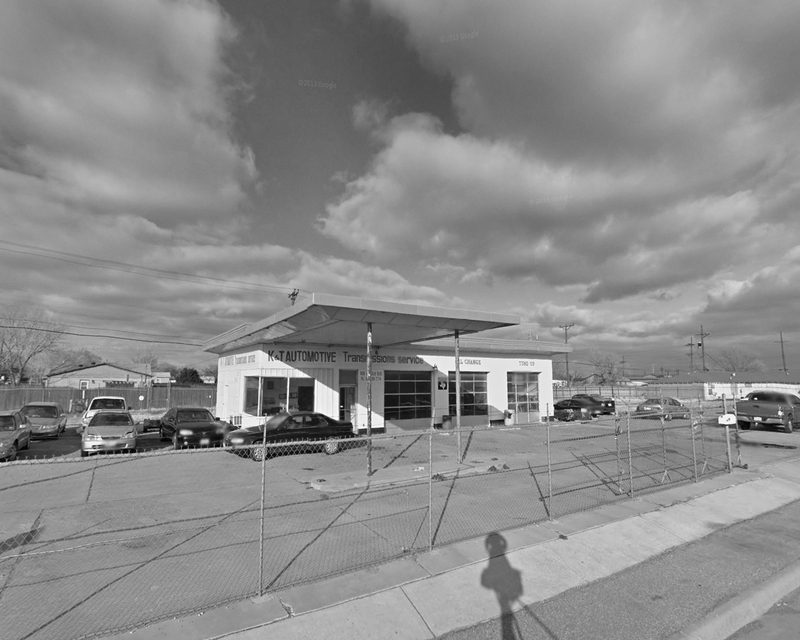 If we take the Texaco on Sunset Strip as an example, they have located it at Hammond Street, a residential area situated roughly 11 miles from the actual location at 8795 Sunset Boulevard, which I found by Googling the Har-Omar Restaurant, a sign for which is in Ruscha's photograph. However, whilst the map is next to useless, there are photographs and short blog entries about their discoveries, dead-ends and u-turns, some of which has already proven invaluable in locating the stations that have been demolished or repurposed. Photographs of street signs are quite useful, even if the locations they're in aren't given there's only 26 to check, so it's certainly helpful. Even so, the locating of the gasoline stations is still proving problematic. 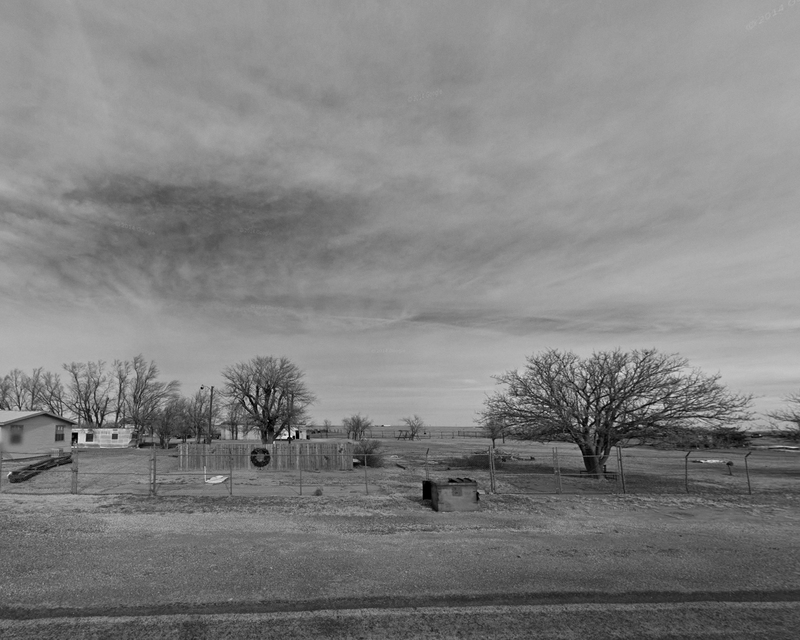 It looks like one of the towns featured in Ruscha's book has been completely demolished when you look on Google's satellite view, although there are still a few buildings left when you look on the earlier GSV, but none of them look like what I was expecting in Ludlow. Maybe that one has gone and can only be approximated? Others have gone, but there are still traces of what was before, the one on Sunset Strip being an example of this as the restaurant still remains and is easily identifiable, but it looks like the gas station is now outside dining. It's similar in other locations too, and I've only confirmed that they're what I believe they're meant to be using the backgrounds. So far, I've located just over half of the sites, with a couple more that are possibles although I'm not completely certain it's the right place, and maybe I never will be. Having found the locations, I'm pseudo-photographing them; picking a location from GSV and composing what I want the shot to look like. Maybe they'll be similar to Ruscha's photograph, but I don't feel that is necessary (nor even possible in some instances). They'll be something I think suits my purposes. In terms of the aesthetics of the images though, I have done some manipulation. I've straightened things, removed excessive convergence that can occur with GSV, I'm not removing other GSV "features" though. I'm also converting them to a monochrome image, purely as a reference to the source material. I might change these choices before the end, we'll see how things go. 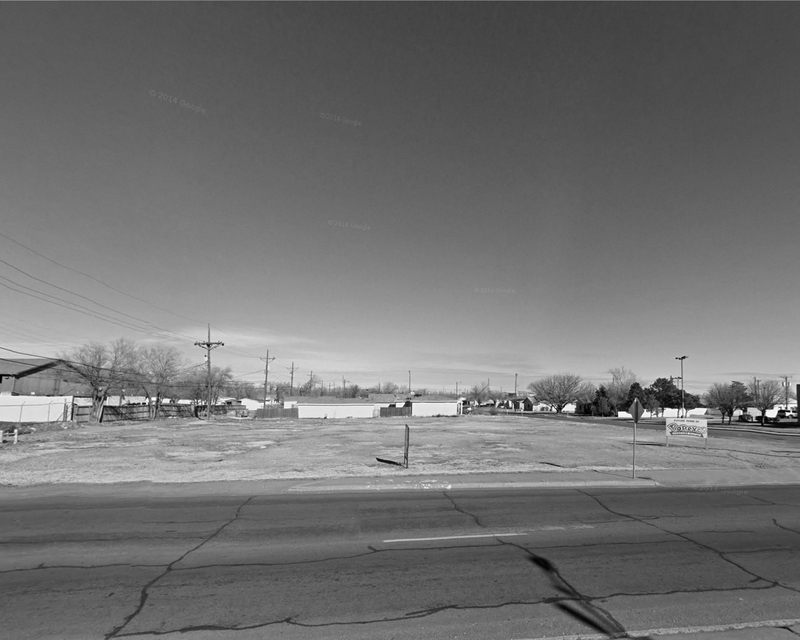 Anyway, here's the Texaco that I've been talking about as it was before and how it is now(ish). Rather than simply copy out the Project Plan here, I thought I'd simply state the idea, and I suppose the simplest way of doing that is with a title: Fifty-Two Petrol Stations. There's an obvious starting point here, and that's Ed Ruscha's Twenty-Six Gasoline Stations; photographs of exactly that, taken on Route 66 in the early 60s. What I'm looking to explore is an appropriation of his idea, rather than simply copying and repurposing his images. One of things that I've found interesting over the years is the elevation of the mundane things that we see but ignore into something that acquires relevance - if it's photographed, it means something. Or so it seems. Doing this will hopefully serve to allow me to scratch a number of itches that I've had for a while. One "itch" stems from Martin Parr's Boring Postcards in that, whilst these are indeed simply postcards you wouldn't necessarily want to receive, they also have some resonance with the cool or deadpan approach of much contemporary photography. Within volume 1 of his book, there's a photograph of The Fast Reactor, Dounreay, Caithness that reminds me of The Bechers and The Tourist Information Centre, Fort William reminds me of Stephen Shore. Don't get me wrong, they're not the same, not by a long shot (although perhaps it should be noted that Shore printed postcards of some of his photographs and inserted them uninvited into postcard carousels....). But there is something there, for me at least. Maybe it's a reflection of contemporary photographic practice, as much as anything. Anyway, I wanted to revisit scenes from the book for my degree, rephotographing them to show the passage of time and with the intention that they be serious photographic art, rather than postcards. For one reason or another, I didn't do it. But I feel like I want to still. 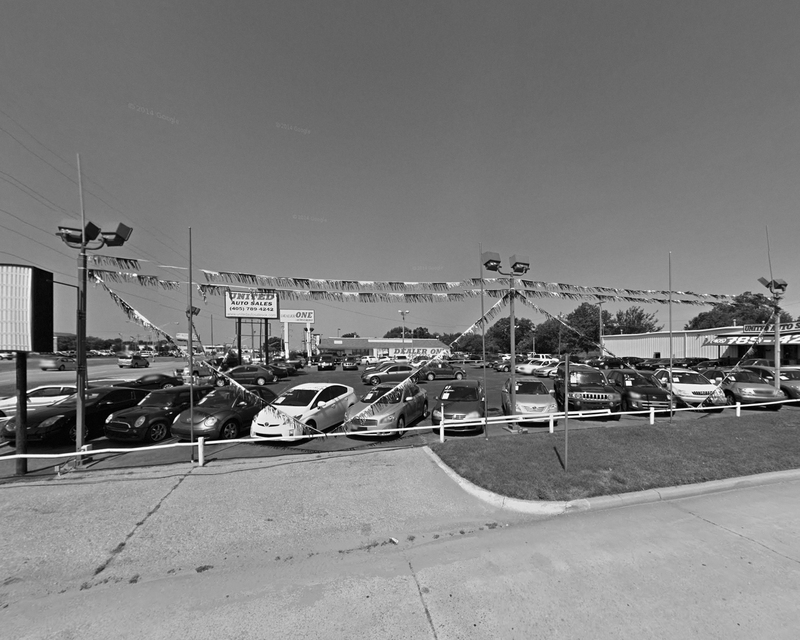 The second itch that I've scratched around a few times is that of Google Street View (GSV). Using GSV is not "photography", but I don't see any reason why it can't be used as a tool in the making of art. What I hope to do is something of a forensic search to find what remains of Ruscha's 26 and rephotograph them using GSV. Not necessarily trying to get the same composition (which would be largely impossible anyway), but to get something I like out of it. This might be an impossible task - none of the gas stations were given particularly definitive titles, "Enco, Tucumcari, NM" is one example. 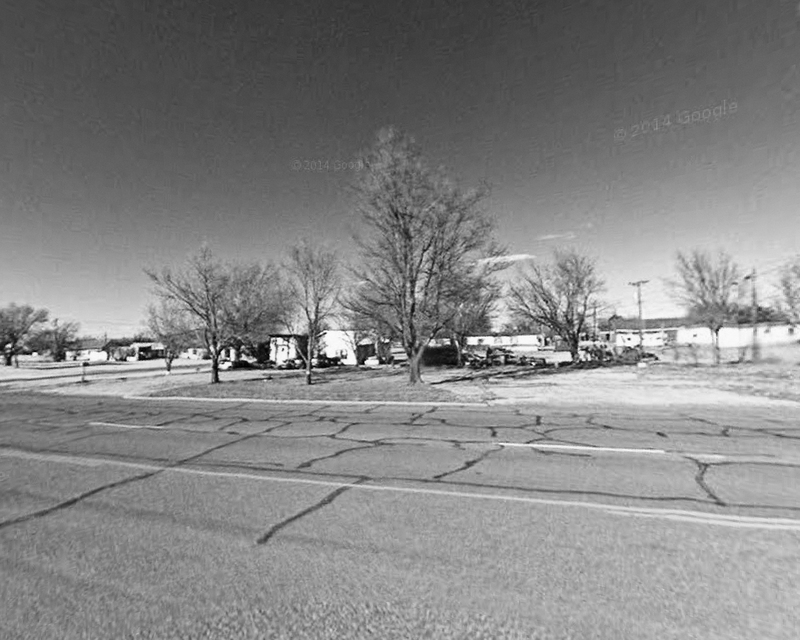 Tucumcari isn't a particularly large town (population circa 5500), but still... Anyway, I'm hoping that by digging around for info on the Internet I'll be able to locate these 26 sites on GSV and create an image using my own composition, etc. Doing this will also serve to scratch the first itch. Will it be possible? Will it be interesting and worthwhile? I've no idea. The second part of the project brings me home. I'm planning to track down 26 petrol stations in the rural (largely farming) community I live in - the Ribble Valley in NW England. I've photographed the Ribble Valley before. It's where I live, so why wouldn't I? It's relevant to me, it makes the project "matter". I'm fairly confident there will be 26, but there is a slight risk here - the Ribble Valley consists of 2 small towns and a number of villages and hamlets, this is no bustling metropolis! In searching out this petrol stations, I'm hoping to create some interesting images of my own. I'm planning on working in two styles, the first being more fluid and casual, the second with a medium format camera, which will likely end up something akin to that included below, which comes from Into the Valley, a project I did a couple of years ago. Which style will I use...? I guess that depends on how I feel when I have a raft of photographs in front of me. Anyway, that's the loose plan. We'll see how it ends up. Parr, M (1999) Boring Postcards. London. Phaidon Press Ltd.